After writing gaming keyboard reviews for a while, I cannot help to ask myself: What is the most important metric we can use to evaluate a gaming keyboard design? To answer this question, a lot of things come to my mind. For example, we often start with the outside look of the keyboard, then we move on to the key caps and switches. Finally, there has to be a part about the actual user experience. However, in the real world, there is only one thing that matters at the end of the day instead of how I, as a reviewer, think of the product: The market response. A well-designed gaming keyboard should make as many people as satisfied as possible. If that sounds vague, let me put in this way. In order to allow more people to enjoy the keyboard, there must be some options people can choose from. 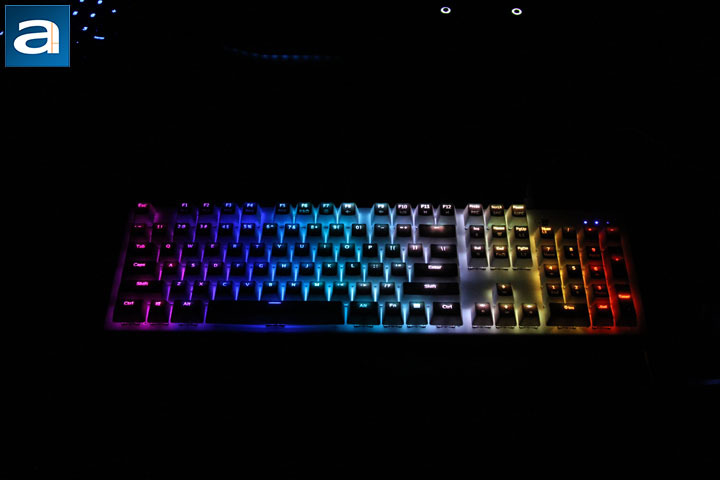 For instance, if we have options in terms of the color, switches, and RGB lighting effects of the keyboard, then it will be easier for the customers to find their preferences, and consequently more keyboards can be sold. For today’s review unit, the Tesoro Gram SE Spectrum, it allows the customers to choose either white or black for color and either blue or red for switches. The RGB on the keyboard is fully adjustable as well. More importantly, the keyboard also comes with four switches of the other type. That is, if you buy a blue switch keyboard, there will be four red switches included in the package, and vice versa. It surely provides lots of options to customers. The only question is, how does this product feel when we actually start to use it? Let us read on and find out. The Tesoro Gram SE Spectrum arrived via USPS/Canada Post to us here in Calgary, Alberta, Canada. As you can see from the picture, the parcel is clean and mostly intact. After thousands of miles of transportation, there is only one dent on the corrugated cardboard. 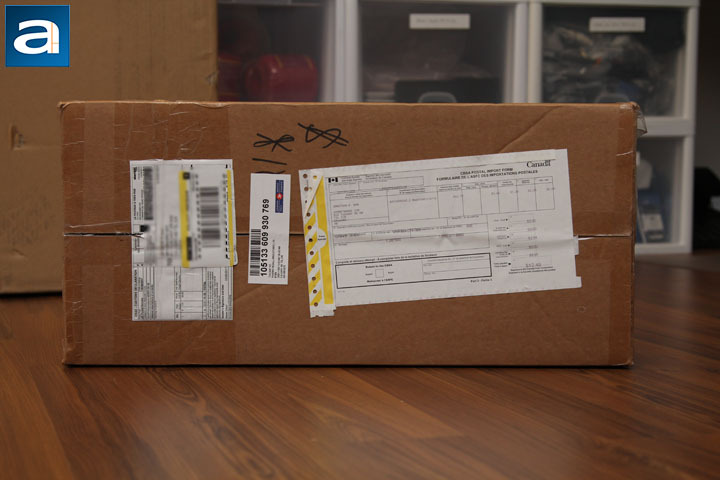 The package was shipped from Milpitas, California, where Tesoro Technology USA is located. As always, I was not the person who received this parcel in the first place, since the package was delivered directly to our Editor-in-Chief Jonathan Kwan. Although there is a light dent on the shipping package, there is no need to worry about the safety of product. 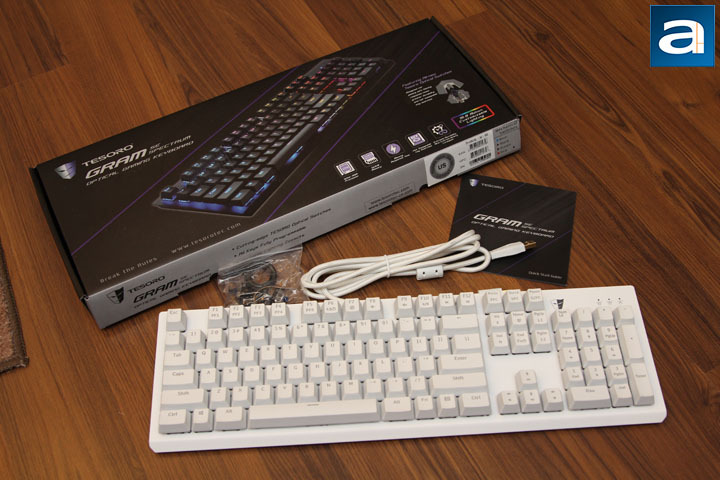 The shipping package and the foam peanuts inside are designed to absorb impact during the delivery period, so the actual retail package and the keyboard are fully protected. A good retail package design should be consistent with the design of the actual product. Considering this requirement, the retail container of the Tesoro Gram SE Spectrum does the job fairly well. For a keyboard retail package, you will usually see a picture of the product in front. In my opinion, if the product picture is located in the middle of the front cover, then everything around should not be too different in style. For example, if the keyboard has a classic and low key design, it would be inappropriate to use a fashionable background or some abnormal fonts. In this case, the background color is matte black, which is consistent with the color of the product in the photo. A pair of parallel purple lines divide the package's front cover into three sections. In the middle section is the product picture. By looking at the picture, my first impression about this keyboard is that it is designed by someone with access only to a ruler. You can hardly find any round lines on the picture of the keyboard, and for those who like a classic look, this keyboard is for you. In the left section of the package front cover, the company’s logo, name, and the product’s name are printed in grey. The color chosen for the logo and names is not abrupt, since the focus is still in the middle section of the package front cover. In the bottom right section, several key features of the Tesoro Gram SE Spectrum are listed. Those features include the use of Tesoro's all-new optical switches, extreme durability, swappable key switches, blazing response time, and 512KB memory. Rather than intending to catch your eyes, the way Tesoro presents those features is more likely to keep the whole picture balanced. Overall speaking, there is nothing wrong with the retail package design. Regarding the overall impression, I would say it is definitely not amazing, but rather well-balanced. Peeling the retail packaging off, we can see the all-black cardboard container of the keyboard, which includes the keyboard itself, a bag of accessories, USB cable, and a user's manual. In the accessory bag, there are four switches with a different color than the switches on the keyboard, one keycap remover, and one switch remover. The keyboard is wrapped with a translucent plastic bag, which can provide protection to the plastic surface from scratches. The user manual serves as a quick reference of the functions. Those include the profile, macro, repeat, volume, keyboard lock, N-key rollover, Fn lock, windows key disable/enable, WASD/arrow key, disable/enable profile reset, keyboard reset, instant macro recording, static lighting recording, and the dynamic lighting recording settings. Remember that the keyboard does not come with any additional software, therefore a quick start guide is necessary. The user's manual is printed out using high quality paper, and it is pleasant to read. The functions are explained in much more detail in the manual. In the review of the Tesoro Gram Spectrum, my colleague Aaron Lai talked about the story of Gram Spectrum. I guess I do not need to repeat the same thing again. This time, the "SE" part of the name will be focused on. Frankly speaking, I have gone through Tesoro’s website several times, but still have no clue what the "SE" stands for. Therefore, I can only assume it stands for "Special Edition" or something along that line. The most significant difference between the SE and the non-SE in terms of outside look is the keycap design. 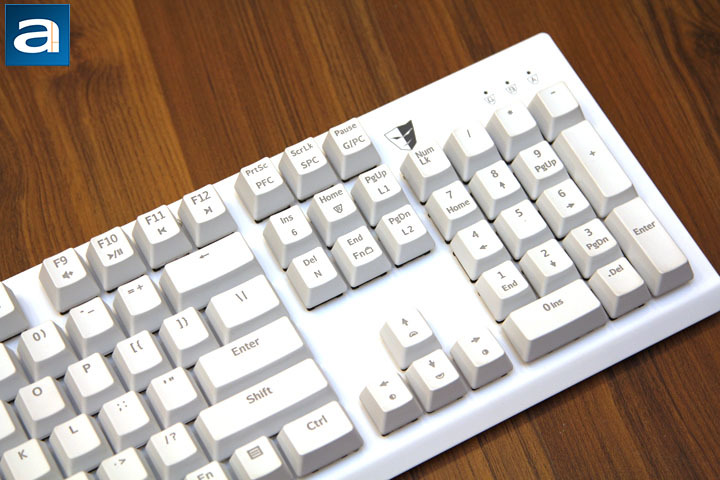 The vanilla edition features low profile keycaps, while the SE has standard height keycaps. Other than that, the SE and the vanilla edition are just like twins. As I have mentioned before, the Tesoro Gram SE Spectrum is likely to be designed by people with only a ruler. From the above picture, we can clearly see that the keyboard is composed of all straight lines. Even the front two corners are cut by straight lines! I believe this is what the Gram series is all about, the minimalistic look. 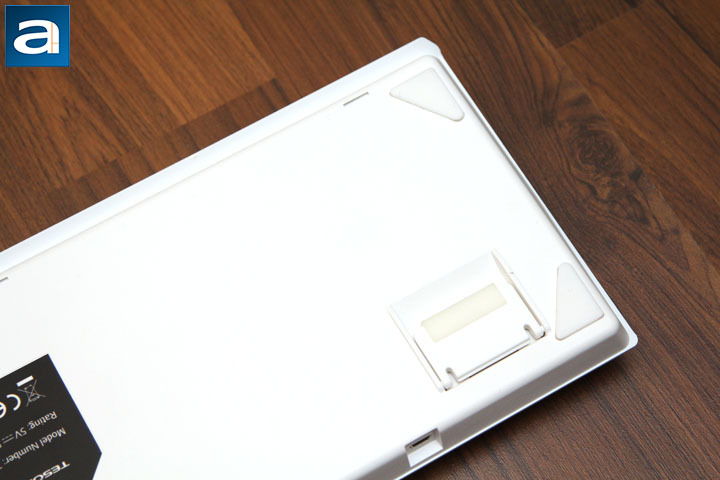 With the matte white color, the keyboard has a very obvious stealth appearance. For a gaming keyboard, there is nothing wrong with such a low-key and conventional design, since winning a battle is everything, and everything else is unnecessary, right? In front of the ten-key is the company logo. Considering the conventional design, the company logo is a nice touch, so the keyboard does not look too boring. By the way, this keyboard does not have a palm rest. If there is a rule that says, "A good keyboard should have a palm rest," then I believe Tesoro definitely wants to break it, haha. Accordingly, Tesoro has "break the rules" as their company slogan. The dimensions for the Tesoro Gram SE Spectrum are 447 mm in width, 33 mm in height, and 136 mm in depth. It is a not among the biggest keyboards out there, but it will not take up too much space on your table. This keyboard weighs about 1.12 kg, which I think is a little bit heavy, but since this is a mechanical keyboard, this is no surprise. It is sturdily built for sure, since there is no flex even if you try to twist it hard. Also, the keyboard will not creak when you try to hold it on the edges. This is because the keyboard's top casing is made out of solid metal. As it is the same as the Gram Spectrum, the SE also features a standard 104-key QWERTY ANSI layout. It is worth noting the Enter key is single row, which is good news for people who like a full size right Shift key. There is only one Windows key on this keyboard, and it is located at the left side of the keyboard between CTRL and ALT. The very important Fn key is at the right side of the space key after the right ALT. All the keycaps are designed ergonomically, therefore they are nice to press. The letters on the keycaps are translucent, so the backlight LED light can shine through. All of the information on the keys are easy to read. Since Tesoro is a company that only makes gaming products, the Gram SE Spectrum is no exception, and it is optimized for gaming performance. There are three major functions that can boost the gaming experience. First, the backlight of this keyboard can be changed to ten different preset modes, namely default, trigger, ripple, firework, radiation, breathing, wave, spectrum, static lighting recording, and dynamic lighting recording. Although by just changing the backlight mode may not help you win the game, it can at least prepare your mind for the specific battle you will get into. The second gaming performance booster is the macro key function. The Gram SE Spectrum allows you to record five sets of gaming profiles, and they can be triggered by pressing Fn + F1 to F5. The macros can be recorded without using any software or driver on your computer, although you need to carefully read the instructions or you may not be able to find out how to record macros. The third gaming performance booster is the Windows key disable function. I like this function a lot, since I used to accidentally press the Windows key when trying to use the left CTRL key. These three gaming performance enhancements can definitely give you some advantages in battle. Speaking of non-gaming usage, the Gram SE Spectrum is capable of delivering a high quality typing experience. In this case, the keyboard is equipped with Tesoro's optical red switches that feel very similar to Cherry MX Red switches. The keyboard is tactile to type on, while it is not very annoying in terms of unwanted clicky sounds. 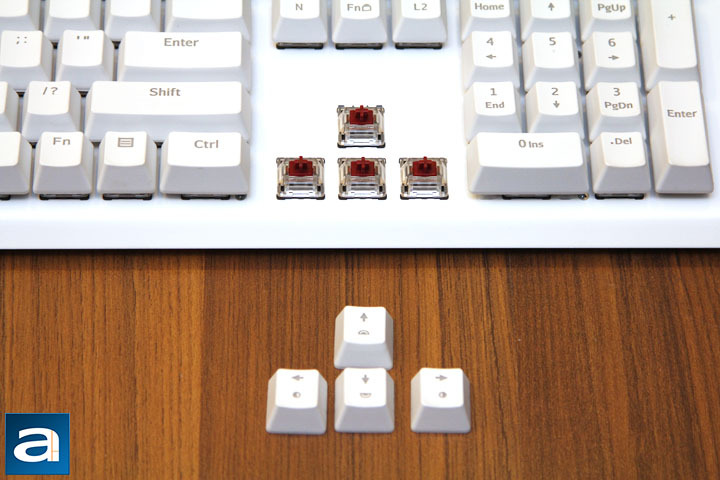 If you think the clicky sound is a must-have item, then the included four blue switches can be swapped to the keyboard. However, in terms of boosting up the productivity, this product is not perfect. There are no Fn-modifier secondary function keys related with productivity work. Functions such as quick email access, calculator access, and web browser access are missing. As a student in engineering, I would really appreciate a calculator quick access function. Anyway, I guess this keyboard is really optimized for gaming, since the majority of the function keys, such as F1 to F5, are dedicated to gaming related functions like macro recording. Fortunately, you can still control your media player using Fn + F7 to F12, to allow mute, volume down, volume up, play/pause, previous, and next controls. The Gram SE Spectrum is a full NKRO keyboard. NKRO stands for n-key rollover, which means there will be a maximum n keys being registered simultaneously by the keyboard. If the number of keystrokes at one time, say m keys, exceeds the number of n, those (m - n) keystrokes will not be recorded by the system, and ghosting may happen, such that some of your actions in the game will be ignored. I remember when I played Need for Speed Underground 2 on my laptop a few years ago, I could not use NOS while turning. This is because the laptop only supports two key rollover. The NOS, turning, and acceleration required three keys to be registered simultaneously. The keyboard also allows you to change to 6-key rollover, which I think it is just a nice feature. Unlike the Gram Spectrum’s conventional Kailh switch, the Gram SE Spectrum uses the Tesoro Infra-red switch. The mechanical key switches are the most important parts on the keyboard, since they define the quality of tactile response and typing experience. If you are not familiar with mechanical keyboards and switches, there are three major types of keyboards we can buy today. Type one is the membrane keyboard, which features low manufacturing cost, but a rather poor typing experience. Mostly because of the low cost, low noise level, and possibility of using it in low profile applications, the membrane keyboard is the most common one on the market. The second type is the improved version of membrane keyboard. The improvement lies in the use of a scissor-like structure, which can improve the typing experience in the switch. This type of switch is mostly used for laptops. 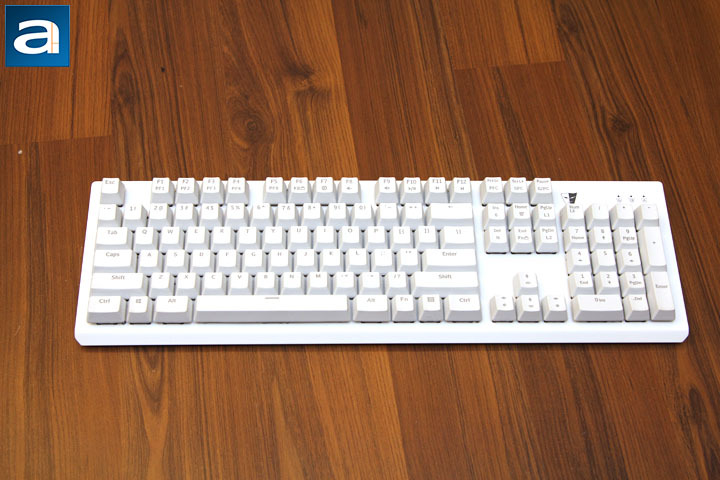 The third type of keyboard feature mechanical switches that provide the best tactile response and typing experience, and they are referred to as mechanical keyboards. The Gram SE Spectrum belongs to the mechanical keyboard family. The Tesoro Infra-red switch on this keyboard has a similar typing experience and clicking sound as Cherry MX Red and the Kailh Red. Unlike conventional mechanical switches, the Tesoro Infra-red switch uses an optical sensor to detect actuation. Compared with the metal contact triggering mechanism, the optical triggering method is not prone to error that is caused by oxidation and wear of the metal surface. Therefore, after a long time of use, the Tesoro infra-red switch can still have low delay times down to 0.1 ms. The lifecycle of the Tesoro Infra-red switch is rated at 50 million keystrokes, which allows you to have 34 years of solid use according to the Tesoro's website. The Gram SE Spectrum is a wired keyboard, therefore, it requires a USB cable to connect to the computer. This time, Tesoro provided us with a nice braided USB cable. The cable is 1.8 m long, which is more than enough for most cases. As you can see from the above photo, there is a micro USB port for the detachable cable. I personally prefer to not have a detachable USB cable on my keyboard, since the more connectors you have, the higher chance you will get bad connections. The USB connector of the Gram SE Spectrum is gold plated. Note that the gold plated connector is only there to make the keyboard look good. There is no actual performance improvement regarding data transmission. At the bottom of the keyboard, there are four pieces of rubber strips: Two at the back and two at the front. All of those rubber feet can provide enough grip to allow the keyboard to be firmly planted. Two risers at the front feature adjustable height levels. It is worth noting the risers are also rubberized to enhance the stability of the keyboard when risers are applied. Once the USB plug of the keyboard is connected to the computer, the backlight LEDs of all the keys will be turned on. In the above photo, the spectrum lighting effect is used. If you are tired of one lighting effect, then it will be a good idea to try some other lighting modes. There are ten preset modes you can choose from without the hassle of using any GUI. To change among those modes, you can simply press the Fn + Left and Right arrow keys. The secondary function symbols on the Left and Right arrow keys are not self-explanatory. At least for me, I have to refer to the user’s manual to find out how to change the lighting mode. Furthermore, you can also choose a set of keys to enter either static lighting mode or the dynamic lighting mode. In order to do that, the Fn + Up or Down arrow keys should be pressed at first to enter the lighting recording mode. Then, the Fn + Page Up or Page Down keys are applied to start the lighting recording procedure. After the set of keys and their lighting sequence are chosen, the Fn + Page Up or Page Down keys need to be pressed again to finish the recording procedure. Everything will become straightforward to you after some practice. I have to say to use the GUI-free way of controlling the lighting mode is a great idea, since it makes this product a true plug-and-play keyboard. For more complex tasks such as the RGB setting, you can always use the GUI on your computer. Furthermore, it can be seen in the photo above, the illumination distribution is even for all keys. 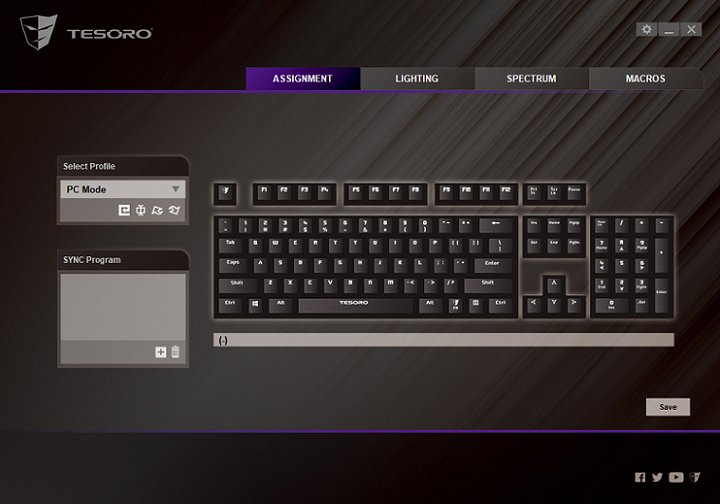 This is because the Tesoro Gram SE Spectrum features per key backlighting. The Tesoro Gram SE Spectrum is mostly plug-and-play. If you want to customize the settings, such as the RGB settings, a configuration software is required. You can download it from Tesoro’s website easily, so there is no need for a physical disc. Just like the keyboard, the GUI of the software is simple and intuitive. The theme colors are black and gray, just like the retail package design. The GUI is pretty straightforward to use, as it is not rocket science. Basically, you do not need to spend a lot of time figuring out how it works. After you are done with your settings, remember to press the save button at the bottom right of the program, and your settings will be saved to your keyboard. If you mess up the lighting setting, you can find the Default button to go back to the original setting. The unwanted macro setting can be easily deleted in the GUI. With the help of the 512K built-in memory, up to five macro profiles can be stored in the keyboard. After a few days of using the Tesoro Gram SE Spectrum, I find it is a really good keyboard, and I believe it has the capability to make everybody happy. In terms of the typing experience, this version of Gram SE Spectrum feels just like any other keyboard with Cherry or Kailh Red switches. You can even take it to your office since it does not have the annoying clicky sound. For the backlighting effects, you can set it to every color in the 16.8 million spectrum thanks to the GUI. I would like to say that I am amazed by this keyboard's bling factor, not just because of how nice it is, but also because it is rather easy to use since it has the GUI to set up RGB. 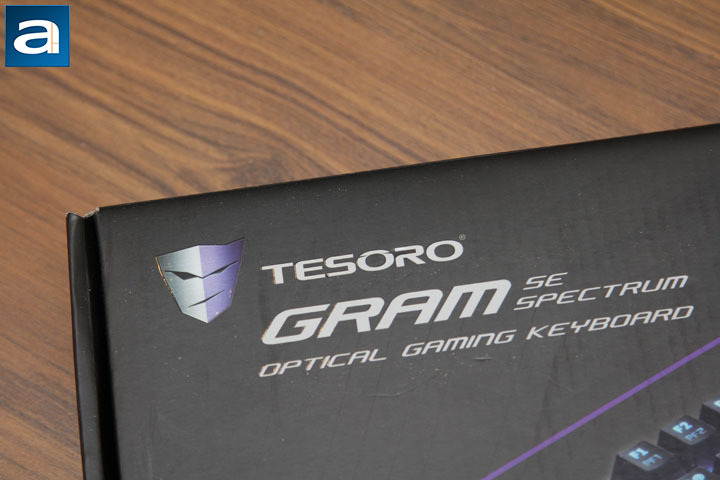 However, the Gram SE Spectrum is not just another nice keyboard to have from Tesoro. The amazing features of this product are mostly hidden inside. For example, Infra-red technology is used to eliminate the double-click and metal bouncing problems caused by worn out metal contact surfaces in conventional mechanical switches. The optical switch has a much longer lifespan than pure mechanical ones, but this feature is buried deep inside the keyboard such that you will not be able to show it off at a LAN party. Guess what, the lifespan related features are not something you can easily demonstrate to your friends. But at the end of the day, it is still a practical gaming keyboard that will last you for many parties. At least, you can have a solid 34-year of use according Tesoro. Its RGB per key backlighting, versatile lighting effects, NKRO, and the nice braided cable make this product qualified gaming gear. The MSRP of this keyboard is $119 USD. I believe the Tesoro Gram SE Spectrum is definitely worth this price, since you can surely enjoy it for a long time -- and this may be what matters most in the end. 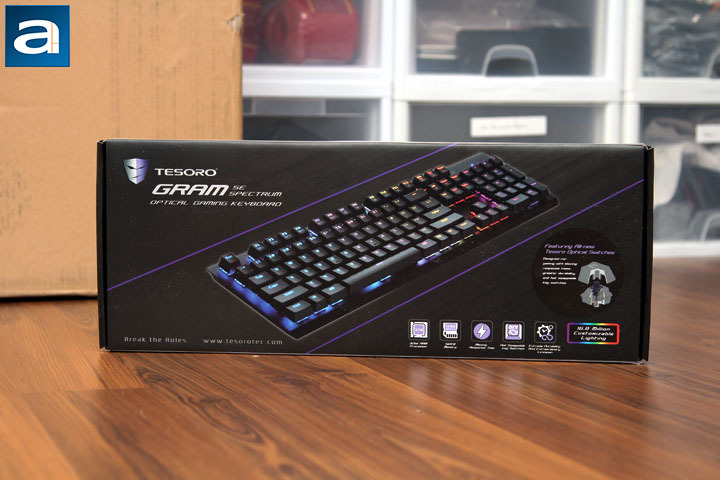 The Tesoro Gram SE Spectrum with optical red switches is a great product for those who are looking for a long-lasting tactile mechanical keyboard with no clicky noise. Do you have any comments or questions about the Tesoro Gram SE Spectrum? Drop by our Forums. Registration is free, and it only takes a minute! posted 13 hours and 10 minutes ago, with 1 posts. posted 13 hours and 12 minutes ago, with 7 posts. posted 13 hours and 13 minutes ago, with 6 posts. posted 13 hours and 15 minutes ago, with 14 posts. posted 13 hours and 16 minutes ago, with 58 posts. posted 13 hours and 16 minutes ago, with 13 posts. posted 13 hours and 17 minutes ago, with 10 posts. posted 13 hours and 17 minutes ago, with 12 posts.